In the grand scheme of generally unpleasant tales, the hierarchy usually runs thus: tales of moral downfall a-lá Citizen Kane, ones about the dangers of religious overzealousness, and stories about cancer. Put ‘em together and what have you got? Bippity-Boppity-Cleansed in Blood. 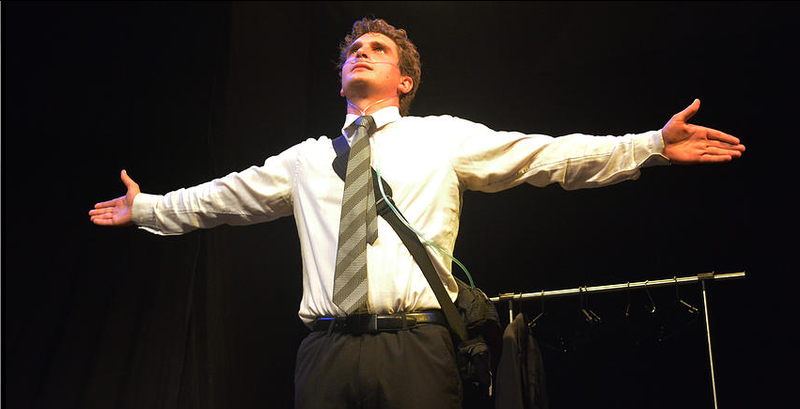 The brainchild of talented writer and actor Thom Jordan, “Cleansed in Blood” tells the story of cancer-survivor-turned-preacher Paul, and his trials and tribulations in his feverish pursuit of glory upon the sanctified stage. Pulling together Jordan’s own experience as the son of a minister and the real-life events surrounding the now infamous Michael Guglielmucci, Cleansed in Blood is a story of ambition, deception and redemption all packed into a dense 45-minute performance. Presenting the show decked out in a nasal feed, Jordan’s stage gravitas is palpable. With minimal set and near non-existent tech, the show lived or died by his performance – and I was very glad to say it was very much kicking. There’s a very raw, unpleasant realism to Jordan’s performance which had me squirming in my seat for a large majority of the performance – a testament to his skill at inhabiting a character. As he strode around the small stage, you’d be forgiven for thinking Thom Jordan a simple pseudonym for charismatic and fervent Paul. And that’s helped in large part by Jordan’s skill as a writer. His accolades are well-won: even without the considerable skill with which it’s executed, this is just a good story, with a twist which will leave you reeling in your chair. However, the structure of the play is less vertigo-inducing. Some plot points feel as if they come too late, and there are moments where certain story strands feel oddly wasted as Jordan rattles through to a nevertheless very satisfying ending. Minimalist in it’s set design but wonderfully baroque in it’s storytelling, Cleansed in Blood makes for an oddly grim yet entertaining way to spend your afternoon. Forceful, provocative and thoughtful, it’s a compelling window into oddly rockstar world of high-profile preachers – and the dangers that lie with fame.